Early last year, my husband had to visit Paris, France for a business trip. Most of our children couldn’t care less that daddy was leaving for a week, except for one 6-year-old child who follows his father around like a shadow. He was very upset and cried often in the last few days before daddy was due to leave. I tried lots of things to make him feel better, including setting some fun tasks to do while daddy was away. We were going to track his flight on the iPad, talk to him on Skype, stay up late watching movies, and our very favorite was we were going to eat ice cream every day for breakfast while daddy was gone. Without daddy here, we could do anything we wanted and break all the rules! We were going to be rebels and party every single day! And it worked; our little man began looking forward to our ice cream breakfast party and looking forward to tracking daddy’s flight. He was upset the first night daddy was gone, but it was a breeze after that. We had a wonderful time. Ice cream is a sort of magical food. It may not be very healthy, but it has a sort of magic about it that just simply makes you feel better when you’re feeling down. Ice cream is also very versatile. Not only would you eat ice cream when you’re sad, but you would also eat ice cream at a party. Not to mention all the different types of ways you can eat ice cream – in a bowl, in a cone, straight from the tub, on waffles, on pancakes, with cake, in a milkshake, in coffee, with fruit. How awesome is ice cream? One of the most awesome ways I’ve ever eaten ice cream was during a Nespresso event last year. Chef Shannon Bennett developed a menu especially for Nespresso’s then-newly released Maragogype which included a delicious gourmet breakfast of duck egg, pear, salt bush and truffle, and for dessert milk and honey ice cream (complete with liquid nitrogen) with muesli and edible flowers. That was my absolute favorite foodie experience ever. That liquid nitrogen and milk and honey ice cream was the inspiration behind today’s recipe. A few weeks ago, Nespresso released a wider range of decaffeinated coffees based off of their existing Grand Crus. I was sent some of the new coffees, along with some ingredients, to inspire me in creating some new recipes. Okay, I’ll admit, I don’t drink decaffeinated. I personally don’t see the point. 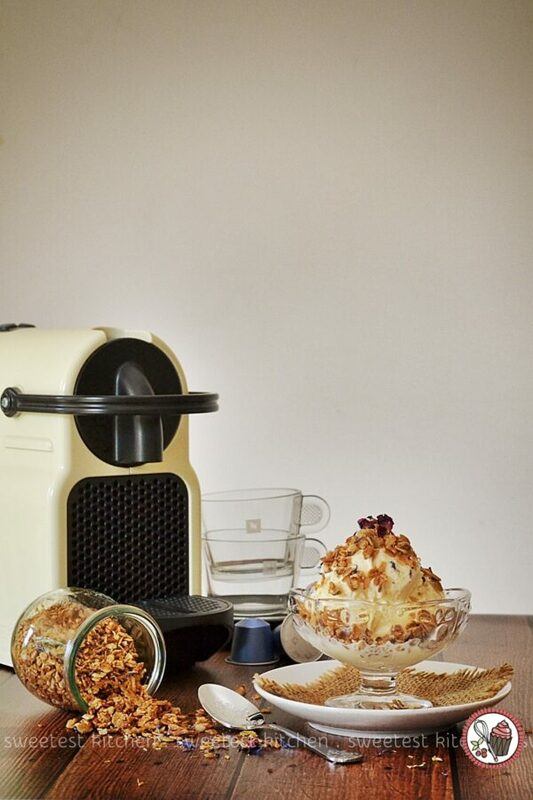 But focusing on creating some new recipes, I chose one of the coffees to work with – Vivalto Lungo Decaffeinato – and the first thing that came to mind was that milk and honey ice cream. I homemade a tub of clover honey ice cream. My original intention was to scoop out the ice cream, form the scoops into a perfect round shape, then coat the ice cream spheres in a layer of espresso granola and sprinkle the entire thing in dried flowers. However, it was a very warm day, and it was impossible to keep the ice cream solid enough to work with. Time for Plan B. Just put the ice cream in a bowl and top it with the espresso granola. Maybe not quite as interesting to look at, but still tastes beautiful! The granola isn’t as strongly flavored with espresso as I wanted, but the flavors are perfectly matched. I tested the granola on regular vanilla ice cream and without a doubt, it tastes 100% better with the clover honey ice cream. 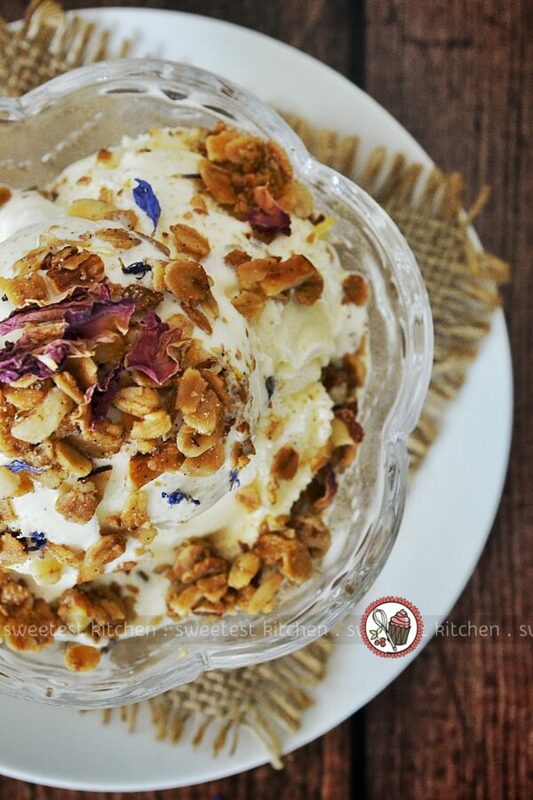 The honey in the ice cream and the floral notes in the granola are just wonderful together. As this coffee is decaffeinated, you don’t have to worry about it keeping you awake at night if you have it after dinner in your dessert. 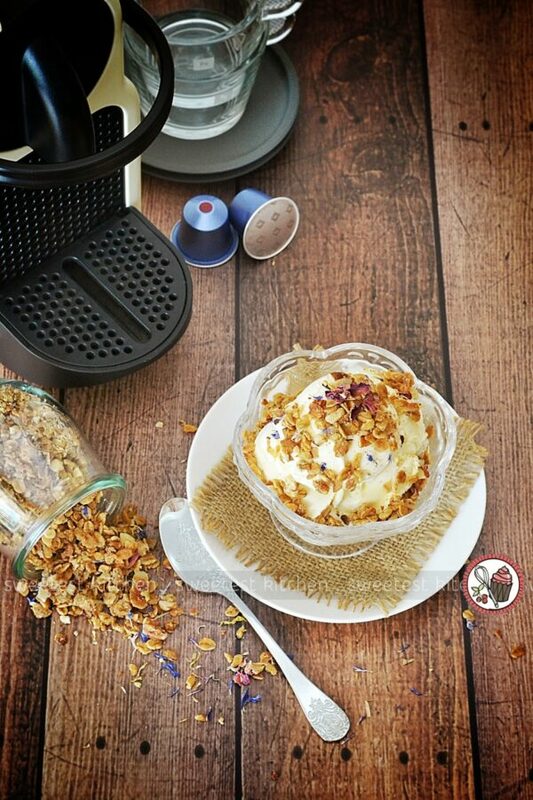 And because it’s granola, you can consider it a modern way to enjoy your breakfast – with ice cream instead of milk! A modern way to enjoy your breakfast! Espresso granola with dried flowers and clover honey ice cream. For ice cream: Add the vanilla extract, cream, milk and honey to a saucepan. Heat over medium heat , stirring often. Bring just to a boil, remove from heat. Cover and refrigerate at least 4 hours or overnight. Pour into an ice cream and churn according to directions. Transfer to an ice cream container or metal loaf pan and freeze. For granola: Preheat oven to 160C and line a tray with baking paper. Whisk together espresso, coconut oil, vanilla seeds, extract and honey. In a separate bowl, combine oats and almonds. Pour the liquid mixture into the dry and stir with a wooden coated until oats and almonds are coated. 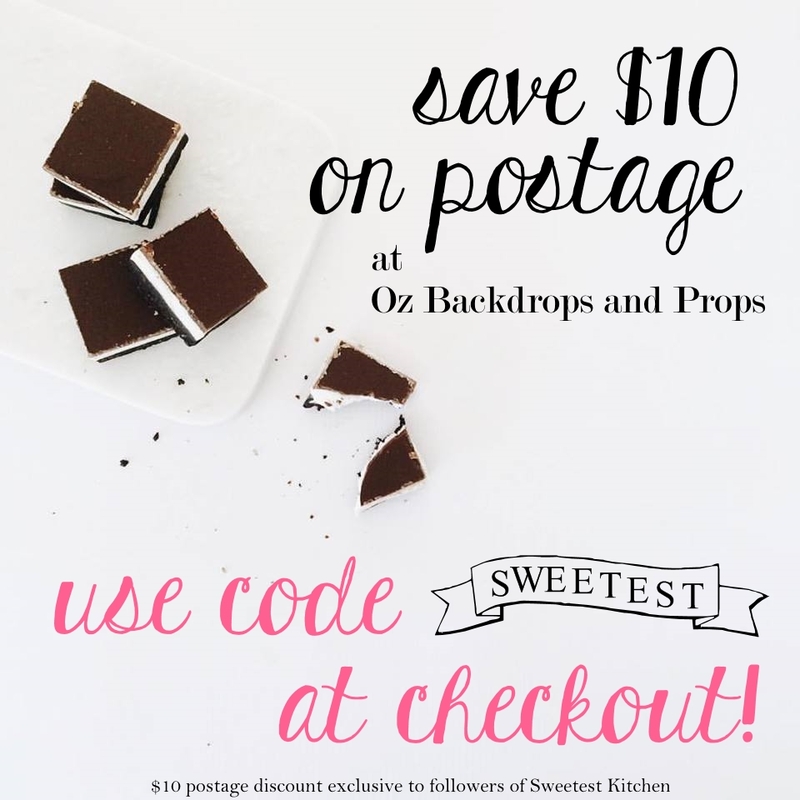 Spread into a thin layer on the prepared tray and bake for 10 minutes. Stir the granola and bake for another 10 minutes or until golden. Remove the oven and cool completely. 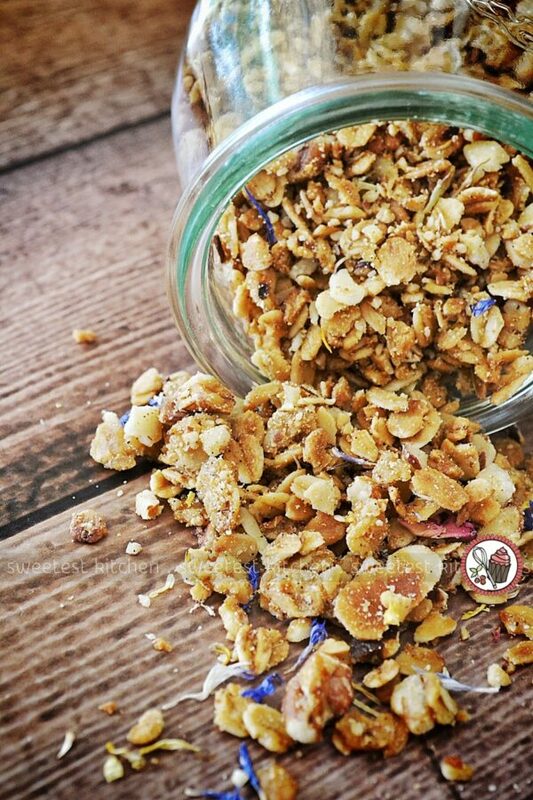 Stir dried flowers into the granola. 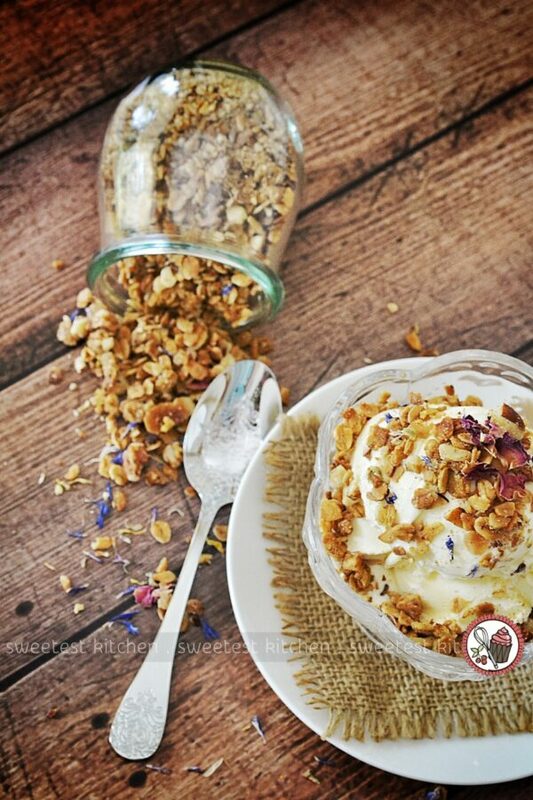 To serve: Scoop ice cream into bowls and top with the granola. Serve immediately.